On the way to the theatre, as the story-line to a gag goes, I was listening to Radio 4's Loose Ends in the car. There were some self-deprecating gags on it, but the thing that struck me was the reference to Alexei Sayle's latest book - 'Thatcher stole my trousers'. To be honest, it was a little tiresome during the Thatcher era to hear 'progressive types' blame Thatcher for all bad things done to them, but for that to live on into 2016 seems bizarre. Margaret Thatcher, and the miners strike of 1984-5 particularly, are reference points for contemporary life even more important than the old reference point of the second world war for a certain milieu, who downplay broader Historical perspective. This is abundantly expressed through the Arts, and the theatrical production Tinned Goods by Tea and Tenacity is a good example of this. 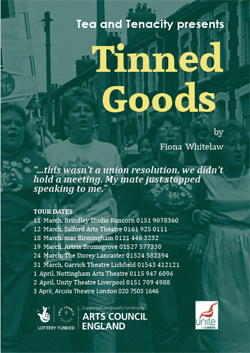 We are introduced to the characters in the play a full 6 months into the strike, 2 months after the Battle of Orgreave, when the political context was pretty much set and the financial affects of being on strike were having a profoundly hurtful impact. Sue (played by Fiona Whitelaw) is seen trying to match up assorted cans of food to make something resembling a meal, and lashes out hurtling the cans to the floor. Her neighbour and erstwhile best friend Rachel (played by Caroline Frewin) responds to the commotion by tentatively coming into her Sue's house. Rachel's husband didn't join the strike, as had to pay the bills and thought there should have been a nation ballot for the strike, and we're introduced to the practical consequences of friends not having talked to each other for 6 months - a stilted and rather shouty dialogue. This is a opening scene so the context has to be shoehorned in which is simply way too cumbersome, stilted and is an almost impossible thing to do - substantiate the claim that the two women used to be the closest of friends through a dialogue where they rehearse how they haven't spoken to each other for the last 6 months. Caroline Frewin plays the far the more believable character here when trying to humanise the relationship by bringing her neighbour a food parcel. Fiona Whitelaw's character of Sue rehearses all the banality of the bureaucratic sloganeering of scab this and scab that when responding to her friend's approaches. A delightful hook is inadvertently provided by Sue when she mentions how Rachel's Aunt had been hurt by the police whilst on the picket line, something she wasn't aware of because her Aunt, Brenda (played by Jenny Stokes) wasn't talking to her either. When Rachel goes and speaks to Brenda some realistic and meaningful conversation takes place which results in Brenda taking Rachel to Nottingham to leaflet and collect money in support of the striking miners. The trip to Nottingham is perhaps the strongest part of the play for me as Brenda takes the initiative to try and win over the hearts and minds of miners wives there to try and build support for the striking miners, the first bit of real dialogue, albeit with a complete stranger. The scene following Brenda and Rachel's arrest by the police for their street campaigning was really quite moving. The essentially political role of the police in trying to break the women's resolve through intrusive and degrading interrogation techniques was powerful and made the first meaningful connection with the audience. Too much was made of police technique for me though, classically seeing the problem of inner city and Northern Ireland policing as a training ground for use against the miners. If only Brenda's initiative to make common cause with Nottinghamshire miners, rather than relying on just labeling them scabs, could have been extended extended to making common cause with the republican struggle in Northern Ireland, more could have been done to help politicise the strike. I understand that accepting funding from the state in the form of Arts Council funding compromises what can be done with a script, but that's probably more an argument to free the arts from state funding. In contrast to the overly bureaucratic and sloganised treatment of the miners wives in the script, Charlene (played by Jade Samuels) and particularly Bethany (played by Laura M Tipper) had a much more realistic and flexible role in relation to the broad experiences around the strike. They expressed a sense of adventure and overcoming of obstacles that was my experience of women around the miners strike - perhaps a shame that their adventures were of the more frivolous in nature. To that end, the best part of the script and evening for me was the transformation of 'scab wife' Rachel who came round to supporting the strike by engaging politically with the barriers to unifying the miners through her campaign work to win over the Nottingham miners. Her transformation into a properly believable character, standing in for Brenda to make the final speech at Ruskin College was a standout moment. The scenery and stage craft was in contrast to the overall shouty script, having a profoundly practical sense about it and austere character that reflected the austere nature of life after 6 months of being on strike, so hats off to Zoe Zolph for the understated set design. Lastly, a big shout out for Salford Arts Theatre which has undergone a bit of a makeover and uplift since I was last there and provides a great resource which I'd like to see more of.